SP 2252 was moved on Monday, October 11, 2004. After years of fundraising and organizing the move and its new location, SP 2252 was moved by truck from the Fairgrounds to a very public place next to UP's Roseville Yard. This location serves as one of the entrances to the City of Roseville. SP 2252 was cleaned, repaired, and repainted before its move near the intersection of Vernon and Atlantic Streets. It's new location is one block east of Railroad Hobbies and south across Roseville Yard from UP's East Valley Wye. This famous locomotive sits in a display setting with a black iron fence, green grass, Redwoods, and a plaque rededicating the SP 2252 as a historic display of Roseville's railroad heritage. 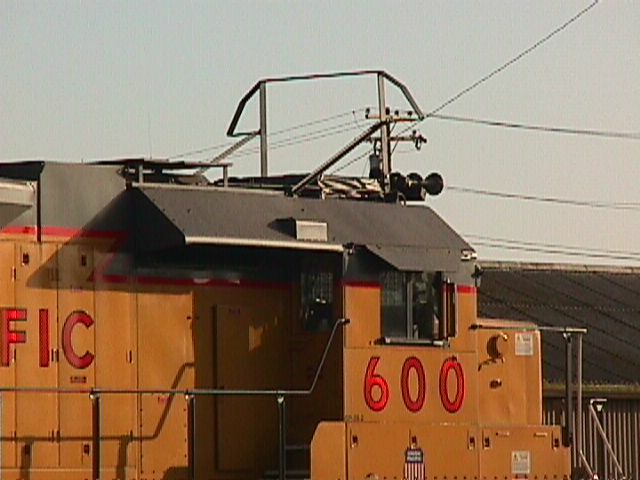 SP 2252 was previously on display at the corner of Lawton Avenue and Los Vegas Avenue, near the main front gates of the Placer County Fairgrounds in Roseville, California. Many of us had driven passed SP 2252 while attending model railroad shows and other events at the Fairgrounds. What is SP 2252's story and why is it on display today? This 104-year old Southern Pacific "Ten-wheeler" was originally built as SP 1838 by Cooke (Builder’s Number 2360) in March 1897, and was placed in service in April 1897. It was classified as a T-1 locomotive along with locomotives SP 2235-2273. In the system renumbering of 1901, SP 1838 became SP 2252. On May 7, 1929, SP 2252 was selected and equipped to become one of the famous fire fighting locomotives used for fighting snow-shed, brush fires, and forest fires along the Donner Pass Route through and over the rugged Sierra Nevada mountain range. This famous railroad line was built during the 1860s by the Central Pacific Railroad as part of the Transcontinental Railroad. Other fire fighting engines of the T-1 class, all built by Cooke, were 2242, 2247, and 2248. SP 2248 still operates today and pulls the Tarantula train on the Fort Worth & Western Railroad. During the summer of 1870, the Central Pacific (after a disastrous snow-shed fire during its first full year of operation) established three fire trains. These trains were set up and deployed at Blue Canyon, Summit, and Truckee. A fourth fire train was set up and deployed at Cisco after disastrous fires near Summit during September 1892. According to John Signor’s book, Donner Pass - Southern Pacific’s Sierra Crossing, the first engines, so assigned, were the Governor Stanford, Grey Eagle, Unicorn and Merced. Larger locomotives, in the form of 4-6-0’s, began to be assigned to fire train service around 1890. Signor writes, "They were equipped with a Duplex fire pump designed to deliver 300 gallons of water a minute through a 1,000 foot 2.5-inch hose. Each train was set up with two water cars, hose, and a complement of ladders, axes, buckets, and similar apparatus." During the dry season, the fire trains were under steam at all times and crews were on duty day and night. Signor also wrote, "Responding to an alarm, the trains would observe no speed limit other than what caution might dictate and they would blow a high-pitched steam siren continuously enroute to the fire." At the end of the 1955 season, SP discontinued the use of fire fighting trains. At this time SP 2252 was 58-years old and the end of steam engines was less than two years away. SP retired the 2252 from its roster on February 27, 1956, and donated it to the City of Roseville on April 25, 1956. Suggested Reading: Donner Pass - Southern Pacific’s Sierra Crossing (John R. Signor, Golden West Books), and Railroad in a Barn by Fitzhugh Turner (American Heritage, Vol. X, No. 1, 1958), for more history about the fire trains of the Donner Pass Route.